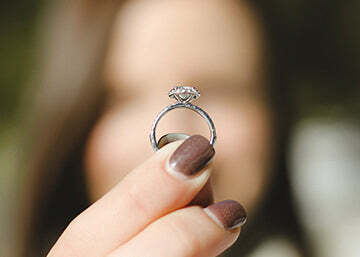 Just because a ring looks nice online doesn’t that mean it will shine in person or that it will last for generations. Why does it matter that “Perrywinkle’s makes the jewelry”? Well, your most cherished possession should be crafted with an old-world artisan mastery. Most online rings, and at mall stores, are made in sweat shops in India using questionable diamonds. Most domestically-made rings are jobbed-out to various contractors, many with unknown standards. Place a Perrywinkle ring next to one from any place else and you’ll marvel at the difference in beauty and quality. Every Perrywinkle diamond is responsibly sourced from the top-one-percent of DeBeers mines at our very own diamond cutting facility. 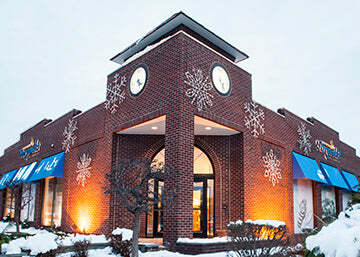 After your purchase, you can tour Perrywinkle’s Forevermark-Certified manufacturing facility with seventy specialists in every aspect of jewelry engineering and design, fabrication, diamond setting, …… and artisan-hand-engraving and finishing techniques. Best of all, you buy direct at the same price that we sell to the finest stores across America, starting under one thousand dollars. Our brand, our history, and you’re our customer. Thank you, Tiffany’s. We think you are a great jeweler as well. Between the two of us, we’re the only fully North American jewelry brands. What differences are there between a jewelry brand and a jewelry manufacturer? A jewelry brand controls everything from concept to finished product using age-old “in-house” perfected techniques. Nothing within the process is ever jobbed-out to outside piece-work contractors or left to others. A brand’s long-term employees think about pleasing its long-term customers. Every person in the manufacturing “chain” is thinking about what happens to the ring when it leaves his/her hands and how perfect it will end up when in the hands of “OUR” customer, who is ours forever. We’re both curious and driven. We invest in and use technology to improve our jewelry products. Our very own aerospace division, A3DM, is the industry leader in plasma spheroidization of precious metals and plasma nano processing. Our Tekna plasma reactor, cools metals from 10,000 degrees Kelvin to 1,000 degrees Kelvin in less than 80 milliseconds. Our aerospace products are actively used in rockets, reactors, and nuclear applications. Our designers are an integral part of our manufacturing process. They are not freelance designers, they work for Perrywinkle’s. Why is this important? Because Perrywinkle designers are part of the entire manufacturing team; they’re not in an ivory tower designing something that will not last, or cannot be properly made, or cannot be made to be comfortable. Our designs have proper scale, stone heights are never “off”, appropriate stone sizes and proper spacing between diamonds are always accurate. We have an obsessive attention to detail down to the most minute features, never clunky, never with stretched surfaces, and never over-designed. Our final finishes are chosen carefully; our designers know each of our jewelers and each capabilities and technique. In addition, our designers know when to design using a technique by hand, or by technology. We don’t just manaufacture engagement rings, we engineer them. Our rings outlast any that do not come from a true jewelry brand. We are jewelers by profession. Most so-called jewelers are merchants who simply buy rings and resell them to you. Our engineers look at our manufacturing processes, putting safeguards and quality control measures into effect that will prevent an engagement ring to fall below Perrywinkle standards. Our engineers anticipate and reject designs having structural weak points, prongs that are susceptible to excess wear, and improper spacing for diamonds. In addition, our engineers look at our metallurgy and test for durability. In Perrywinkle culture, science and skill makes our jewelry ageless, beautiful and durable. Most all designers or jewelry manufacturers do not cast in-house. Most of them purchase their castings from independent casters. At Perrywinkle’s, our proprietary in-house methods for casting, using responsibly-sourced metals, are central to our brand. Our metal treatment, after casting, is a trade secret and unique to the jewelry industry. Why is this important? Starting off with a fully densely made ring setting displaying a baby-smooth “skin” is core to a fine engagement ring’s quality. The more perfect the casting, the finer the finish and polish that can be applied to its surface, and the easier it is for a setter to masterfully secure the diamonds without using excess metal to hold them in. With less perfect castings, jewelers must fill holes and cracks with solder that cannot be seen after a ring is polished. The smaller diamonds, that are an integral part of the ring design, are often overlooked but make a significant difference to the overall look of an engagement ring. The side diamonds should be as nice as center diamond otherwise your eye will notice something’s "off." Perrywinkle small diamonds come from the most exclusive diamond mines and Perrywinkle’s cuts them with virtuoso skills so that each one is a brilliant masterpiece. That’s what a true fine jewelry brand does. There is not another engagement ring that you can purchase where the manufacturer of the ring also manufactures the diamond, other than Tiffany. That makes a purposeful difference to you especially since there’s a reasonable chance that other engagement rings contain synthetic diamonds. Every diamond in every Perrywinkle ring is natural and incredibly beautiful with an inner blaze that’s best described as "alive." Most fine jewelry is manufactured in sweat shops in India. Our manufacturing facility looks more like a Swiss watch factory where you can eat off the floor. 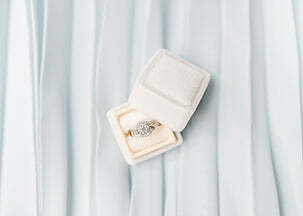 It’s regularly inspected and certified by Forevermark. All of our materials and equipment is responsibly sourced. Our jewelers are skilled, proud and simply the best in the business. Once you own a Perrywinkle engagement ring, you qualify to take a tour of our facility. We encourage you to take a tour. Since we make diamonds and engagement rings that are unmatched by others, we can back our diamonds and engagement rings unlike others. Your engagement ring is covered by the best-in-the-business warranty that provides a LIFETIME DIAMOND LOSS GUARANTEE, 30 DAY UNCONDITIONAL GUARANTEE even covering accidental damage, a 30 DAY MONEY-BACK GUARANTEE, a DIAMOND GRADE GUARANTEE, an INCREASE IN VALUE GUARANTEE toward a trade-in, a LOWEST PRICE GUARANTEE assuring you that Perrywinkle will not be undersold, an ETHICALLY SOURCED GUARANTEE, plus many FREE SERVICES.